or when the equipment is under the circumstances of the load vibration. Before being cured：It is safe, environment-friendly and easy to be operated, with good flow-ability and strong fill-ability. After being cured: It features low shrinkage percentage, strong bonding performance and high-carrying capacity,and can be removed. the surfaces of the cone and of the liner plate can be precoated with appropriate amount of machinery oil or release agent. Open up the drum containing A-pack of BD67 backing adhesive liquid, and then stir it with the electric agitator for 2 minutes. suggested not to surpass 30kg at one time. Fill the adhesive liquid into and seal up the equipment as soon as possible after the concoction. (at the temperature of 0 degree). At the time when the temperature surpasses 5 degree the casting time would be shortened. and if necessary, you shall guide the adhesive liquid to flow by means of the plasticine as the cofferdam, till the liquid spills from the gap top. of the adjusting sleeve which is contacted with the filling adhesive liquid, so as to make it convenient to exchange the liner plate. Cure the adhesive liquid at the indoor temperature for 12~14 hours. The higher the curing temperature is, the faster the curing speed. Generally the adhesive-filled equipment can be put into use after 4 hours in summer, and after 8 hours in winter. you shall try not to spread the adhesive liquid on it. 2.In the event of excessively low temperature,the time from concocting the BD67 backing adhesive liquid to using it up shall be prolonged. 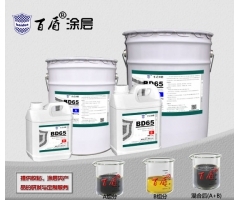 But in this way the BD67 backing adhesive liquid concocted would be of high viscosity, which makes it be difficult for casting. temperature and then mix it for use. concocted at one time, and perform the casting process and the adhesive-liquid concoction side by side. as soon as possible after the concoction. can not be too much.Otherwise it would be partially cured into the solid before being filled into the equipment. and the stained eyes shall first be flushed by clean water and then be treated by professional doctors. at one time is 100kg, which is packed in plastic drum. crusher backing adhesive epoxy filling compound that expired, if proved qualified by test, still can be used right along.